This sponsored post was produced in partnership with . Bring it! The galette is one of the easiest and most basic French pastries. Unlike so much French cooking (especially pastry), the galette is imprecise and flexible, not bound by rigid rules and shapes. That it's so rustic and free-form is part of the appeal. And it's what makes it so great for home cooks and young cooks. This recipe is a variation on a classic Jacques Pépin recipe for plum galette. You can use any of a number of fruits depending on the season. 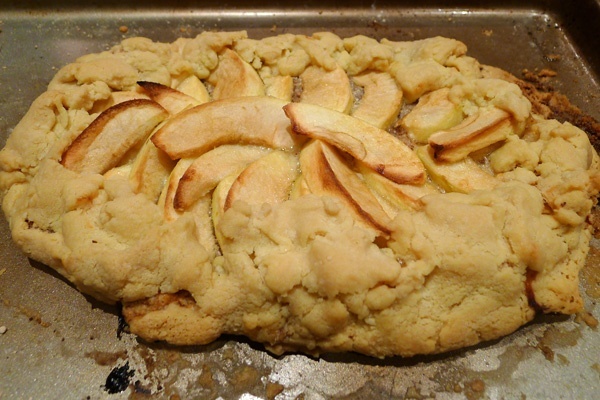 We used apples and substituted gluten-free flour. Jacques and his daughter often cook together. A young assistant can be invaluable in the cooking process. 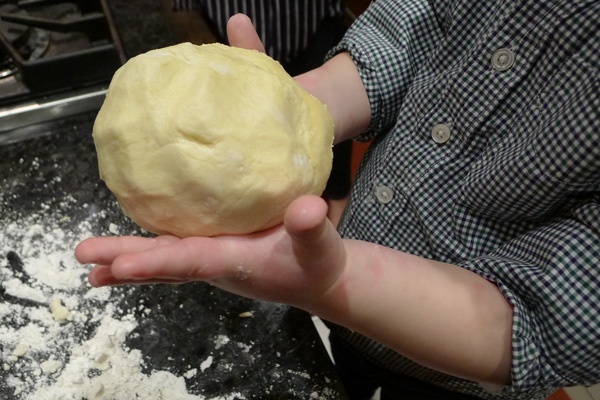 Even two-year-old hands can pat dough. 1. 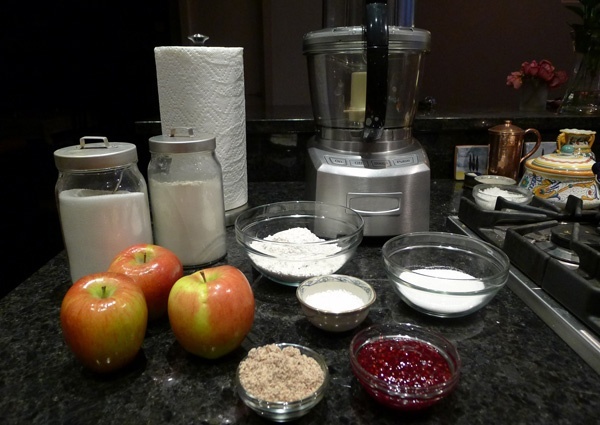 Mix flour, butter, and salt in a food processor and process for 5 seconds. Add ice water and process for 5-10 seconds, until dough comes together. 2. Remove the dough from the processor and gather it into a ball. 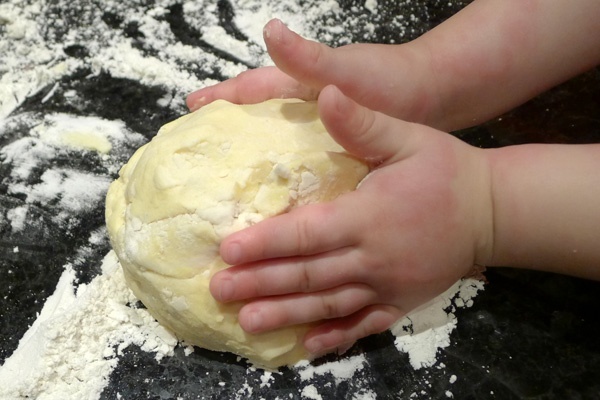 On a lightly floured surface, roll out the dough into a thin oval shape. If the dough is hard to work, chill it for a few minutes. 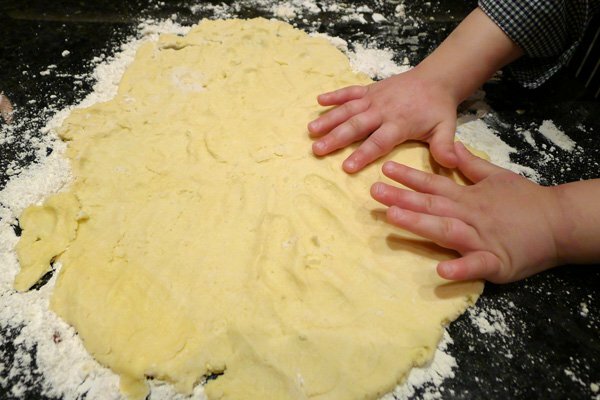 Alternately, place the dough directly into the baking sheet and spread it out using a rolling pin or your fingers. Don’t worry if it’s bitty and piecey. It will cook together in the oven. 3. Put the dough in the refrigerator for about 20 minutes. Preheat the oven to 400°. 4. Combine 1/4 cup of sugar, ground almonds, and flour, and spread over the dough to within an inch or so of the edge. 5. 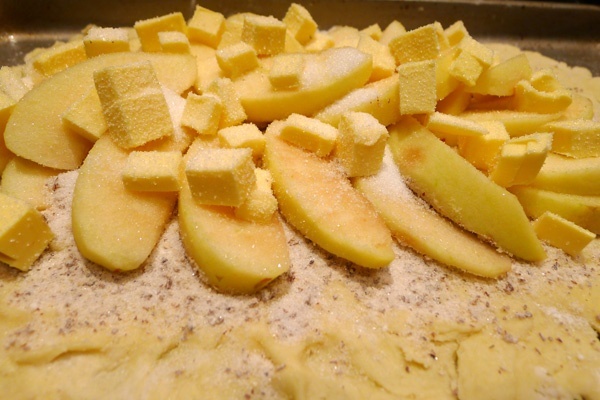 Arrange apple slices over the sugar mixture and top with small chunks of butter. Sprinkle most of the remaining 1/3 cup sugar over the fruit. 6. Fold the dough up over the fruit to create a border. 7. Bake the galette for 1 hour and 15 minutes, or until the fruit is soft and the crust has browned. If you'd like to add a topping, brush the preserves over the hot fruit and the crust. Serve warm or at room temperature.